The Counter Terrorist Trends and Analyses (CTTA) carries articles with in-depth analysis of topical issues on terrorism and counter-terrorism, broadly structured around a common theme. CTTA brings perspectives from counter-terrorism researchers and practitioners with a view to produce policy relevant analysis. 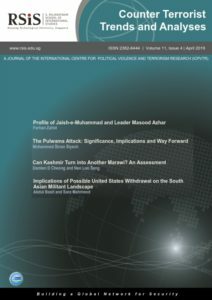 Launched in 2009, Counter Terrorist Trends and Analyses is the journal of the International Centre for Political Violence and Terrorism Research (ICPVTR) of the S. Rajaratnam School of International Studies (RSIS) at the Nanyang Technological University (NTU), Singapore. The CTTA has a circulation of more than 11,000 subscribers. The suicide attack on India’s paramilitary Central Reserved Police Force (CRPF) in Kashmir’s Pulwama district has once again exposed the sharp fault-lines between India and Pakistan, pushing them to the brink of war. The February 2019 attack, claimed by Pakistan-based anti-India militant group, Jaish-e-Muhammad (JeM), killed 40 CRPF personnel. This attack and its aftermath underscores a new phase of militancy in violence-ridden Kashmir and renewed hostilities between India and Pakistan. India’s retaliatory airstrikes on alleged JeM camps inside mainland Pakistan (after a hiatus of five decades) have redefined the conflict threshold. In 1999, even at the height of the Kargil crisis between the two states, the Indian air force did not cross the Line of Control. Indian airstrikes signal a qualitative shift in the Indian position from the strategy of deterrence-by-denial to deterrence-by-punishment. Consequently, this will result in a new unstable equilibrium, lowering the threshold of a low-intensity, limited conflict between India and Pakistan over Kashmir. Moreover, the absence of a functional India-Pakistan crisis management mechanism further increases the probability of a limited conflict. The United States (US) and international community’s response to the Pulwama attack and its aftermath is also pertinent. Instead of urging both India and Pakistan to desist from escalation, for the first time, the US and international community acknowledged India’s right of self-defence and emphasised de-escalation only after Indian airstrikes on alleged JeM camps in Balakot. Barring China, no other country condemned India’s violation of Pakistani sovereignty. This will have long-term implications on strategic stability and balance of power in South Asia. The Pulwama attack has also witnessed emergence of new interlocutors in India-Pakistan tensions such as China, the United Arab Emirates (UAE) and Saudi Arabia. JeM has 40,000 trained militants in its ranks and returned to Kashmir in 2016 with the Pathankot air base attack. Between then and the Pulwama attack, it has increased its activities and presence in parts of Indian Administered Jammu & Kashmir (IAJK). The use of a Vehicle Borne Improvised Explosive Device (VBIED) to hit a military convoy in a highly-militarised zone like Kashmir shows JeM’s enhanced operational capabilities. Accumulating 80 kilograms of highly explosive ‘RDX’ and preparing a VBIED signify the expertise of JeM’s cadres. The suicide bomber Adil Rashid Dar was a local Kashmiri, whom JeM had recruited by exploiting his anger and quest for revenge against the Indian state to serve its agenda of ‘liberating’ Kashmir. After witnessing a dip between 2008 and 2013, violence and militant recruitment have spiked in Kashmir since 2015. The number of militants killed in Kashmir rose from 130 in 2016 to 200 in 2017 and 240 in 2018. In the first two months of 2019, 31 militants have been killed in Kashmir. At the policy level, Pakistan’s response to the JeM threat is critical. Kinetic measures against militant groups such as sanctions, arrests and crackdowns, helpful in the short-term, need to be supplemented. Non-kinetic measures like an effective counter ideological narrative and a comprehensive de-radicalisation and rehabilitation plan would be necessary to create incentives for JeM members to shun militancy. The larger question is how will Pakistan create a counter ideological narrative against JeM without compromising on the state’s identical stance on Kashmir? Moreover, effective rehabilitation of a large number of militants will require massive time and resources and a strong political will by the Pakistani military and political leadership. In 2002, when the military regime of General Pervez Musharraf banned JeM and took action against its cadres, the group retaliated with two assassination attempts on him, alongside several high-profile attacks inside Pakistan. In the event of another round of crackdowns initiated against JeM, a serious backlash cannot be ruled out. Moreover, if JeM splinters as a result of heavy-handed crackdowns, some of its members might gravitate towards terror groups like Islamic State of Khorasan (ISK), Al-Qaeda in the Indian Sub-continent (AQIS) or Tehrik-e-Taliban Pakistan (TTP). India and Pakistan, beyond proxy warfare, will have to dispassionately discuss the security challenges arising out of various terrorist groups operating in the region. India and Pakistan will have to create joint counter-terrorism and counter-extremism frameworks to overcome the challenge of militancy, notwithstanding who launched and supported these groups since the 1980s. Against this backdrop, the current issue features four articles looking at different aspects of the Pulwama attack and its aftermath. In the first article, Farhan Zahid traces the background and current status of JeM and its founder Maulana Masood Azhar. The author maintains that Azhar’s ideology had a significant impact on the evolution of Kashmir’s militant landscape. Headquartered in Pakistani Punjab’s Bahawalpur province, JeM has longstanding ties and nexuses with other militant groups in the region such as Al-Qaeda (AQ), the Afghan and Pakistani Taliban and Lashkar-e-Jhangvi (LeJ). These ties have allowed JeM to evade bans and crackdowns from the Pakistani security forces in the past. Notwithstanding information that Azhar is critically ill and his brother Mufti Abdul Rauf Asghar and brother-in-law Qari Talha are running JeM’s day-to-day operations, the author emphasises the need to create counter-narratives against Azhar’s violent ideology. The second article by Muhammad Sinan Siyech dissects the Pulwama attack using Louise Richardson’s conceptual framework of the Three Rs (Revenge, Renown and Reaction). According to the author, the Pulwama attack manifested all three Rs making it a highly successful attack for the JeM. The suicide bomber was seeking revenge for repeated arrests and humiliation faced at the hands of Indian security forces. JeM also drew maximum attention from mainstream and social media in the aftermath of the attack. The attack centre-staged Kashmir as a core dispute between India and Pakistan and a nuclear flashpoint that needed serious international attention. It also prompted immediate reactions from India in the form of retaliatory airstrikes on JeM camps in Balakot, escalation of India-Pakistan tensions and stringent security measures in Kashmir. The author argues that such security measures in Kashmir would likely provide JeM with fresh recruits and funding. To mitigate this likelihood, there is need to examine India’s domestic responses in Kashmir, with continued diplomatic pressure on Pakistan to take action against anti-India militant groups. It is also necessary to strengthen international ties to ensure timely information and intelligence sharing to curtail terrorist networks and their financing. The next article by Damien Chong and Neo Loo Seng discusses whether Kashmir could turn into a future bastion for the Islamic State (IS) akin to Marawi in the Philippines in the aftermath of the Pulwama terrorist attack. Various arguments are discussed for and against such a scenario. On one hand, continued violence, socio-economic and political instability in Kashmir, similar to the situation in Marawi in 2017, are pull factors for transnational threat groups such as IS. This is particularly in light of the recent collapse of IS’ territories in Syria/Iraq prompting it to re-group elsewhere. Proponents of the contending view argue that such an outcome is implausible as threat groups have thus far failed to effectively exploit the Kashmir conflict, given it is framed as a territorial and political dispute as opposed to an Islamist conflict. By assessing a broad spectrum of scenarios, the article discusses the pitfalls of the Marawi case and how they can be avoided in Kashmir. The last article by Abdul Basit and Sara Mahmood looks at the security and geopolitical implications of possible US withdrawal from Afghanistan on South Asia’s complex and diverse militant landscape in the context of the Pulwama attack. After 9/11, the US presence in Afghanistan had kept India-Pakistan tensions under control to ensure Islamabad’s cooperation in the border areas to track and hunt AQ remnants. A case in point is the US-brokered 2003 cease fire agreement between India and Pakistan. Now that the war in Afghanistan is nearing its end, tensions between the two South Asian nuclear rivals over Kashmir threaten to provide fresh fuel for regional militancy and bilateral tensions to persist. It seems that several militant groups like JeM which diverted their fighters to Afghanistan after 9/11 to assist the Afghan Taliban in fighting the US are now returning to their old conflict zones through incidents like the Pulwama attack. The Afghan Taliban’s perceived victory in Afghanistan will create a triumphant jihadist narrative for a plethora of militant groups in the region, giving them new zeal and fervour which will make the South Asian militant landscape more lethal and violent. To be added to the CTTA mailing list, please email your full name, organisation and designation, with the subject ‘CTTA Subscription’ to [email protected]. Counter Terrorist Trends and Analyses (CTTA) welcomes contributions from researchers and practitioners in political violence and terrorism, security and other related fields. The Counter Terrorist Trends and Analyses (CTTA) series for 2018 welcomes topical, timely and relevant policy-oriented articles that allow readers to gain an in-depth understanding of the overall global and regional threat landscape. This could include strategic counter-terrorism issues, regionally focused articles as well as specialised topics. Rise of right-wing extremist movements in North America, Europe, Australia and other regions. Analysis and policy responses to ethno-nationalist, separatist and non-Islamist extremist/terrorist organisations. Developing areas including cyber terrorism, cyber security, innovative policing techniques and evolving counter-terrorism responses. Please email your submissions to [email protected]. Submission deadlines: The CTTA is published monthly; submissions should be made by the 5th of each month for inclusion in the following month’s issue. Preferred file format: MS Word document. Please do not submit in PDF format. Originality: The author should only submit her or his original work. The author should not submit concurrent manuscripts (or manuscripts essentially describing the same subject matter) to multiple journals. The author must first seek editorial permission, if he or she would like to submit an article which has previously been published elsewhere. Editors are entitled to request the author to provide the raw data for her or his research for convenience of editorial review. Manuscript title: The title should be limited to 15 words or less; the title should be a brief phrase describing the contents of the paper. Abstract: The abstract should summarise the manuscript content in 70-100 words. The abstract should be informative and self-explanatory, and should state the argument of the article and its major conclusions. Standard nomenclature should be used, and if abbreviations are used they must be defined at their first mention. Word length: We publish articles within three different categories with varied word lengths. This includes, (i) commentaries: between 1,000 to 1,500 words, (ii) regular articles: between 2,000 to 3,000 words, and (iii) in-depth feature articles: between 4,000 to 5,000 words. Structure: Please divide your article into subtopics with subheadings. Style: British spelling and language style are used for the CTTA (as with other publications of ICPVTR and RSIS). References and citations: Chicago Manual of Style (Footnoting system) is used. If the author has used work, ideas and/or words of others, appropriate citations are required within the text of the article. Author should provide a list of references to indicate all sources that have supported the research at the end of the article. Author information: Please include complete names and affiliation/ and or experience of author(s) in a few lines at the end of the article; contact email address of author(s) can be included. The author should give due acknowledgement to all individuals who have made contributions to the research, and those who have contributed significantly to the research should be listed as co-authors. The author should ensure that all co-authors have affirmed the final version of the paper and have agreed on its final publication. Copyright: The copyright of a published article will remain with the author(s); the author(s) agree to require that the Counter Terrorist Trends and Analysis (CTTA) journal be given credit as the original publisher in any republication of the article authorised by the author(s). Such credit shall include a proper citation to the article’s publication in the CTTA, including the author(s), the journal, the volume and issue numbers, the year of the article’s publication in the journal and the internet address for the issue. The Editorial Team reserves the right to make changes to the content of submissions for publication and/or reject a submission at its discretion. Please contact us at [email protected] if you have any queries pertaining to the CTTA submission guidelines or editorial style and policy.